This is the year when some of Animation's Royalty turn one hundred years old. Chuck Jones, Frank Thomas and Ollie Johnston, who will be 100 this Halloween. Marc Davis will hit this mark next year, and Ward Kimball in 2014. 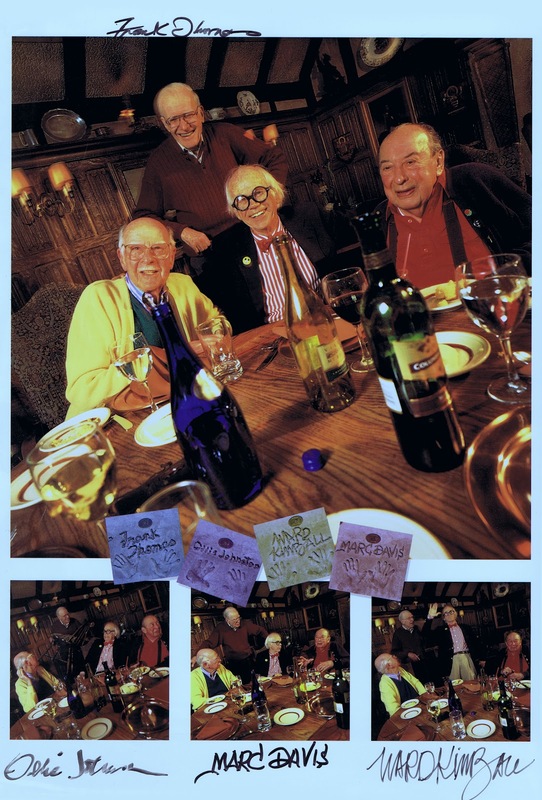 For this Disney Magazine photo shoot these four got together in December of 1997 at the local Tam O'Shanter restaurant. What a rowdy bunch!! I wonder if they ever had the chance to meet up again after that day. The Tam opened in 1922, and it was one of Walt Disney's favorite restaurants. And I can see why. It has the authentic charm of a Scottish Highland's Inn. And the food is very good, too. During a recent visit there a waitress pointed out to me what used to be Walt's reserved table. Who says LA has no history?